Meet the 34′ Tow Behind lift available for rent at Shaughnessy Rental. This tow-behind lift is compact yet productive. 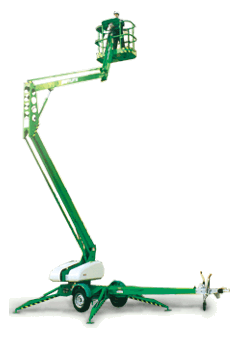 The telescoping boom is just one of the many features found on this lift. Hydraulically operated outriggers make setting up quick and easy, not to mention giving you stability and peace of mind when working at 30+ feet! This lift as a 34′ platform height and a 20′ outreach from center. Call Shaughnessy Rental now for availability!